Early May in Japan is exhilarating. Sakura blossoms have given way to raggedy full leaves. Pink tufts of fallen, swirling petals gather everywhere. The azaleas pop and everywhere is color. 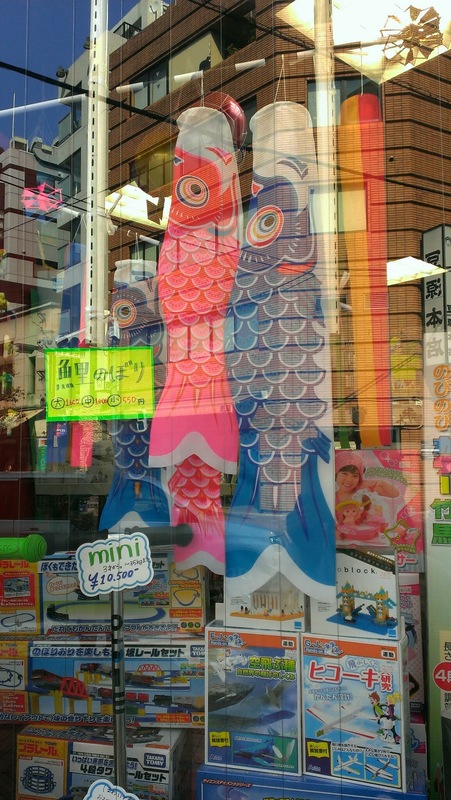 Long koinoburi, giant koi fish windsocks, billow from every school and whip their fins in every neighborhood of Japan. The festival of Children’s Day is here. 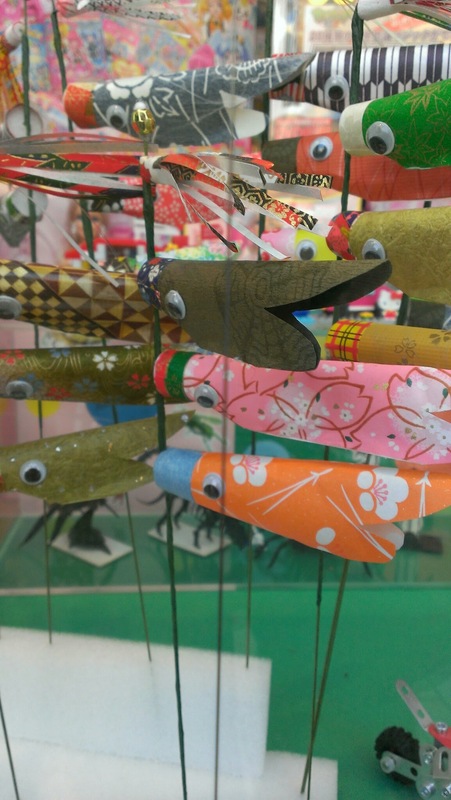 The giant carp streamers, koinoburi, highlight Children’s Day, or Kodomo no Hi. Actually, the term Children’s Day is a tad misleading; this is generally a holiday to honor boys. The koi fish call to mind strength and vitality, as carp travel upstream. Samurai warriors and their helmets, kabuto, are also symbols of Kodomo no Hi. This is a day Japan honors strength and determination, qualities the nation sees in their boys. Every home with one or more sons will typically fly their own koinoburi. Koinoburi spotted in our over 100-year-old mom & pop toy shop. You may spot pictures and little clay sculptures of a warrior boy named Kintaro. This is a fictionalised character who was a great warrior from Japanese days of lore. Kintaro, meaning “Golden Boy”, is said to have possessed such gentility, bravery, and strength that he rode atop bears and giant koi. Here in Japan, girls have their celebratory day, too, March 3rd. Certainly girls and their strong spirit are also prized. Schools everywhere in Japan involve both boys and girls in each holiday; each holiday has its own songs, its own sweets and decorations to relish. Though the holiday used to singularly belong to boys (formerly called Tango no Sekku), it stands as a day to honor the spirit and life of children. 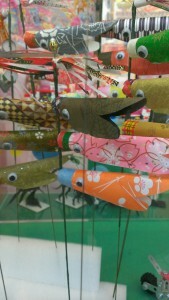 Kodomo no Hi falls on the last day of Golden Week, a whole string of memorial days grouped together. Kids can indeed “be kids” with parents and grandparents in the park or the zoo or just relaxing together as a family. I have my own visions of my son years from now on this day, coming in from our neighborhood park, beetles in hand, dirt smudging his fleshy cheeks, and even a baby red slider turtle poking out from his dungaree pocket. I am ready to honor this boy, to everyday thank God for my amazing kids. Fly streaming fabric koi? Absolutely! It is just glorious. 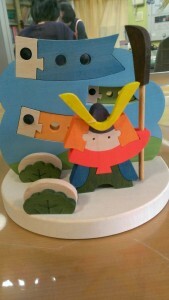 On Children’s Day, families eat kashiwa mochi, shown in the 3d puzzle above. 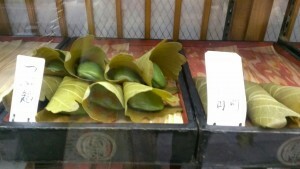 This is sweet bean paste filled sticky rice/mochi, enveloped in an oak leaf. Why oak? It is a symbol of family prosperity and life. Oak leaves do not fall until a new leaf grows. (Note: don’t really eat the leaf. Just enjoy holding the gooey mochi with your leaf as keeping your fingers clean). In the West of Japan, where oak typically does not grow, families may eat similar mochi wrapped in waxy bamboo leaves or elegant iris leaves. Kashiwamochi, with oak leaves wrapped around each sweet package, at our local traditional sweets shop. 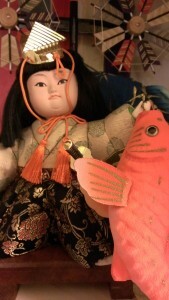 The whole koi/samurai motif and spirit of the day is both artful and adorable. It is a Pinterest page just waiting to happen. 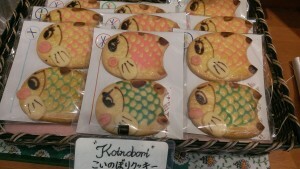 Picture fish-shaped cookies, samurai cupcakes, teeny pennants of koi fish to make koinoburi. You really could get as carried away as those fish pushing upstream. Commemorative fish cookies at my favorite French bakery–right in the neighborhood! The thing is, life is indeed precious. Looking back, many babies did not make it to toddlerhood. Many women died in childbirth. Male babies, in particular, are still thought to be weaker. Japan now has some of the best stats regarding infant mortality rates, but of course, current times are much rosier than Japan’s past. Even so, the country currently bears the weight of a declining birth rate that is quite staggering if you follow estimates into the future. With lower-than-low fertility rates (we’re talking basement low) and some of the world’s heartiest seniors, living well into their nineties, the government projects that by 2060, the country’s population will be under 90 million people. (A 2014 census shows population estimated at under 127 million. Almost 30% of the current population is over 65). Maybe that doesn’t sound terrible, but nearly half of the population will be over 65. Japan is winning records—the decline in Japan’s population set another record in 2012 in terms of the number of deaths exceeding births…for the sixth year in a row. Just ugh. When Maki, our close family friend and Godmother to our daughter, asserted that boys are weaker in utero, especially in the past, I dismissed it as old-wives-tale-malarkey. A bit of research later and I am just mouth-open in disbelief. Boy babies are far more likely to be miscarried. Boy babies are far less likely to survive pre-mature birth. The holiday, then, is not only a celebration, but also a prayer. 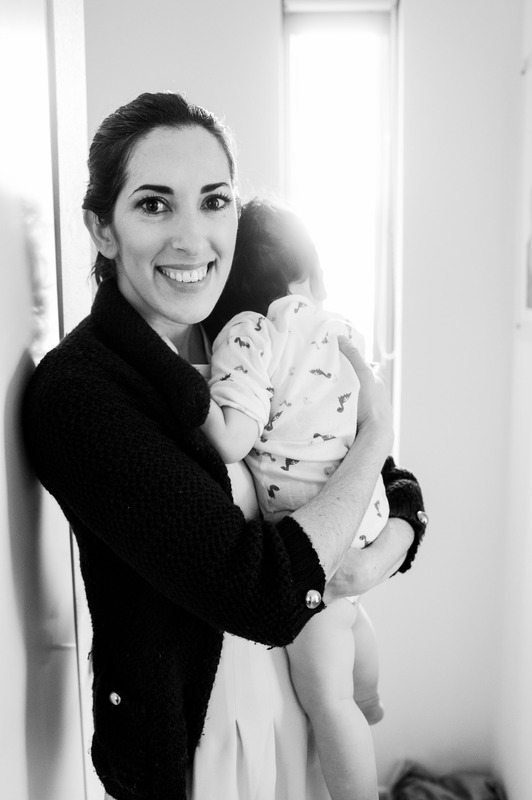 We ask for strength for our little boys, for life itself and the joy that comes when cradling our incredibly tiny and remarkable babies. It is a call to little boys—be strong, come forth. Perhaps the beloved windsock-koi is also, then, a symbol of fertility, of the bubbling joy of life that springs up in families, in a nation, in a world that possesses an innate esteem for the life and spirit of its children. Tender moments at our Tokyo birth house. A big sister is born, a little boy is loved. 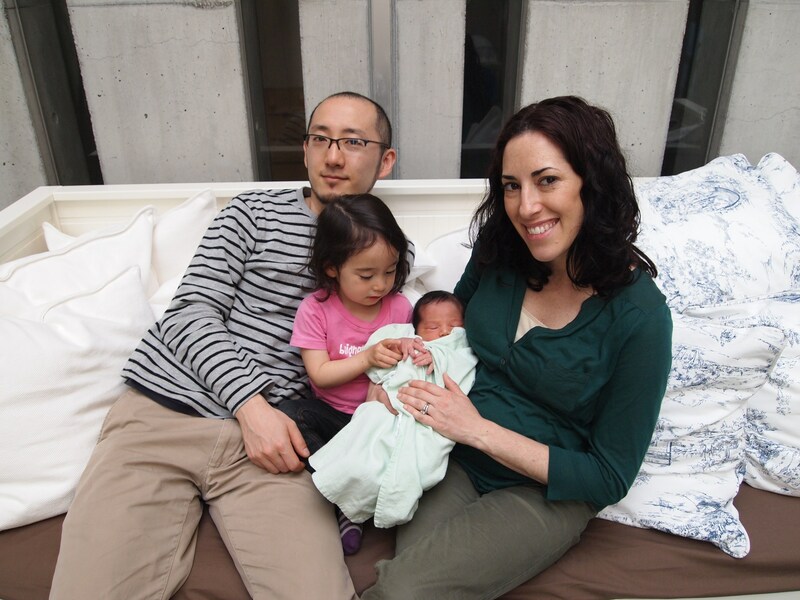 In the meantime, there are koinobori crafts to make, picnics to pack, and a great desire to hug and kiss my precocious, mochi-covered kiddos. You can find us at the park this Kodomo no Hi, as we celebrate our boy’s first birthday. The streamers will be flying high. Wonderful post. This year we are studying Mexico. Next year Japan is definitely our educational destination!